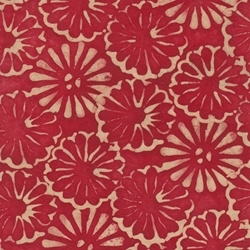 This bright Lokta paper sports deep red ink with floating floral designs on a natural colored base. Natural Lokta Batik Paper is hand-made through a lengthy wax layering process resulting in vibrant colors and one-of-a-kind designs. Hand-placed beeswax creates beautiful floral designs and patterns while semi-translucent dye covers the rest of the paper. Once the dye has fully dried, the wax is removed in a multi-step ironing process returning the Batik Paper to its natural Lokta texture. Choose from 2 sizes: 6" or 9". The six-inch pack contains 12 sheets of paper while the 9" pack contains 6 sheets of paper. Because the paper is handmade, there may be a slight variance in weight/color from sheet to sheet.